I've been a bad blogger lately, I know. I started a new job, took some time off in between and have been pretty caught up in every day life. So to make up for it, I've been sure to take photos of some new recipes I've thrown together that I thought would be of interest. I wrote about my patio garden a few weeks (maybe a month ;) ago and I've really put it to use lately. The following recipes all utilize ingredients from my garden, which has also been super convenient because I haven't grocery shopped much lately. You'll also notice that some of the same ingredients are used in all three recipes. 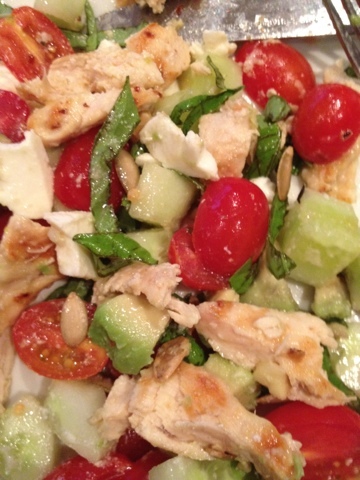 You do not need to spend a lot of money to eat healthy, you just need to get a little creative and mix up the flavors. I've made all three of these meals since last Friday, I haven't food shopped for anything extra once. These recipes are EASY, healthy, and very flavorful. Also, the mint/cucumber salad/chicken recipe and the pasta recipe are loaded with protein. Here's how to do it! Why mix up an old favorite? Why not? 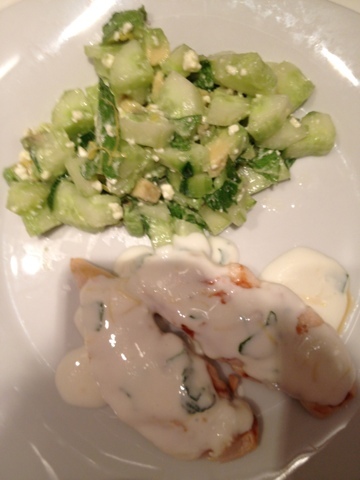 The cucumber adds crunch and bulk. The pumpkin seeds add mono-unsaturated fats (lowers LDL cholesterol and helps absorb the nutrients in the veggies) and they also add crunch. 1. Slice tomatoes in half, dice cucumber, dice mozz, dice avocado, cut basil into strips and arrange on plate with a sprinkle of pumpkin seeds. 2. Marinate chicken in olive oil in lemon, o/o, crushed red pepper, lemon, and salt. Throw on the grill pan, grill or saute pan and cook through. Dice and add to salad. 2. Cook chicken with lemon, salt, pepper, o/o on grill pan, grill, or saute pan. 3. In a separate bowl, mix greek yogurt, the juice of one half lemon, lemon peel, chopped mint, and salt. 4. Once chicken is cooked, add the greek yogurt mixture. The greek yogurt adds an extra protein if you're feeling you need it! (Hint: This meal would probably taste better with pork or lamb, but, I had chicken in my freezer so I had to deal). I came home from a pretty tough boxing class tonight and craved something that would replenish my energy (I wassss wiped). Anyway, I figured some barilla protein plus pasta would do the trick but I didn't have the energy to defrost and cook chicken, so I used cottage cheese. Why? You might wonder. Well, I first read about using it in one of my health magazines a few years ago, tried it, and loved it. 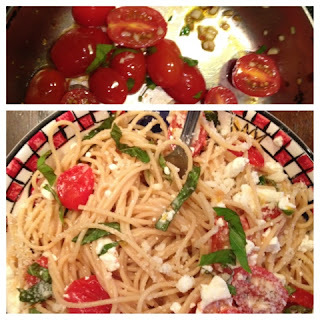 If you add mozzarella or feta to the pasta - it all kind of blends. I promise it basically takes on the flavors in the pasta and, most importantly, the protein amino acid compound in cottage cheese has been known to heal muscles faster than other forms of protein. So try it. 2. Once pasta is done, add 1/4 cup of cottage cheese, mozzarella cubed, and the saute pan sauce, then sprinkle with basil and a little bit of Parmesan.